Despite all the evidence to the contrary, conservatives who fail to understand the arguments from liberals about right wing hate speech act as if Jared Loughner lived in a vacuum and acted with absolutely no external influences. This is despite multiple reports indicating Loughner’s interest in fringe politics. NewsOne reports on yet another connection, alleging that Loughner is a fan of right winger Alex Jones. I find it curious that conservatives have been attacking liberals this week who have expressed concern about speech and internet postings which could inspire violence. They apparently see nothing wrong with this, but many of the same conservatives went ballistic over a joke by David Letterman a couple of years ago (which they proceeded to distort in their attacks on Letterman). Certainly calling on supporters to “reload” while linking to a picture of members of Congress in crosshairs is of greater concern than a late night comic’s joke, even if the claims conservatives made about it had been true. 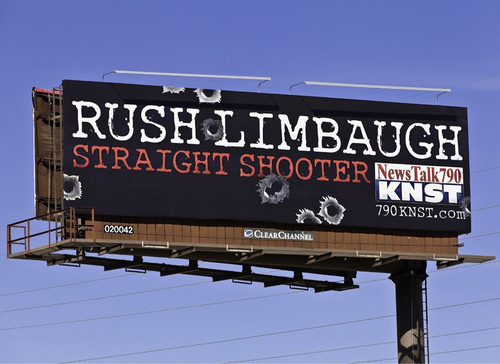 Liberals are not saying that Palin, Angle, Beck, or Limbaugh is directly responsible for the recent shootings, regardless of how often conservatives make this claim. We are saying that their conduct is, at very least, far worse than jokes from David Letterman, comments from the Dixie Chicks, and many other items which the right wing regularly goes berserk about–and actually does contribute to acts of violence. We have yet another example today of right wing violence with an arrest for threatening a member of Congress. Sarah Palin, incidentally, who regularly dodges the media due to an inability to answer questions, has agreed to a television interview. It is to be conducted by Sean Hannity–hardly a challenge for Palin.